Inspired by Californian state law and the L.A store in mind, we’re excited about one of our latest releases, the Sweet Leaf ring. 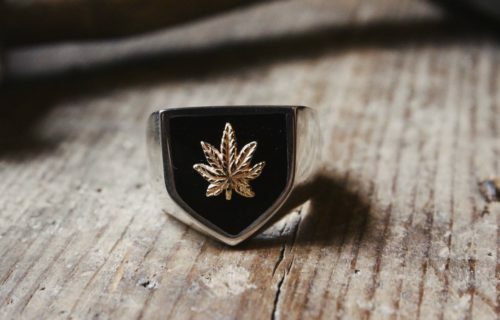 Carved by owner and designer Reino, the Sweet Leaf ring is based upon the same design as our Skull Shield ring, and comes with either a sterling silver or 18ct yellow gold leaf upon a black enamel shield in a sterling silver setting. Please note this ring doesn’t come in a ‘standard size’, we are only able to make this ring in your specified size. Please get yourself measured in-store or at a local jewellers rather than guessing; an additional sizing will have to be outsourced with a laser specialist and cost £40.